ECTOPOPTERYS W. R. Anderson, Contr. Univ. Michigan Herb. 14: 11. 1980.—Type: E. soejartoi W. R. Anderson. Woody vine; stipules small, triangular, borne on stem between petioles, distinct or adjacent stipules connate, persistent; petiole eglandular or distally biglandular; lamina bearing glands in abaxial surface. Inflorescence a terminal and lateral panicle, the flowers borne in decussate 4-flowered umbels, 6-flowered corymbs, or pseudoracemes; floriferous peduncle well developed; bracts and bracteoles eglandular. 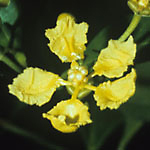 Sepals leaving outermost petal exposed in enlarging bud, eglandular, strongly reflexed in anthesis; corolla bilaterally symmetrical, the posterior petal very different from the lateral 4; petals light yellow, glabrous; lateral petals with the margin dentate; androecium bilaterally symmetrical; stamens 10, all fertile; filaments longer opposite sepals than opposite petals, connate at base, glabrous; anthers all bearing tufts of hairs at base and apex of locules, strongly heteromorphic, of 3 types: 5 anthers opposite sepals introrse, the locules much exceeded by the globose glandular connective; 3 anthers opposite anterior-lateral petals and posterior petal like those opposite sepals but with the glandular connective not or barely exceeding the locules; 2 anthers opposite posterior-lateral petals latrorse, much reduced, the connective hardly developed and nonglandular; pollen globally symmetrical, with several non-parallel colpi and non-equatorial pores; receptacle glabrous on both sides of stamens; gynoecium bilaterally symmetrical; carpels 3, broadly connate in ovary, all fertile; styles 3, with large internal stigmas; anterior style dorsally extended at apex in a hook bearing pendent triangular folioles; 2 posterior styles laterally flattened, truncate at apex and coherent or connate along their upper edges. Fruit dry, breaking apart into samaras separating from a short pyramidal torus; samara with the dominant wing elongated and apparently dorsal, thickened on abaxial edge and bent upward, the veins terminating in the thinner adaxial edge (resembling a samara of Heteropterys); nut bearing 1 or 2 winglets or crests on one side. Chromosome number: n = 8 (W. R. Anderson, 1993a); photos. Ectopopterys is easily recognized, given its eglandular reflexed sepals, distinctive androecium with two anthers reduced and five with an elongated glandular connective, anterior style bearing folioles like those of Stigmaphyllon, and samaras superficially resembling those of Heteropterys. Its chromosome number is unique in the family. Reference: W. R. Anderson, 1980. Etymology: The name Ectopopterys comes from the Greek words for displaced (ektopos) and wing (pteron), and refers to the author's belief at the time of its description that the apparently dorsal wing of the samara was derived from a lateral wing.